My hubby is home! :) For the past 10 days, my new hubby was in Mexico on work-related business, but he came home today and I wanted to make sure that his first evening home included a delicious home-cooked meal.... vegetarian, of course! :) I chose to make the chickpea "sensation" patties from the book Eat, Drink and Be Vegan... yes, I love this book and have been using it a lot lately! LOL The chickpea patties have been a sensation in the blogosphere ever since the book hit the shelves. And with good reason... they are delicious. My omni hubby doesn't like whole chickpeas, but he does like hummus; I was hoping he'd go for this recipe so I could lose my chickpea patty virginity. He was quiet in the car when I revealed what I was making for din-din... it made me nervous, LOL. I wanted the meal to be special, not unappealing. I started to think I made the wrong choice. But once I started cooking them, he commented that they smelled good... and when he dug his fork into them and took a bite, a reassuring "Oh yeah, these are good" was all I needed to hear... score! :-D I served the patties with real mashed gold potatoes and we smothered both in a vegetarian mushroom gravy I spied at Whole Foods Market. OMG, Whole Foods! That's one of the best things about living with my hubby... he has a Whole Foods just five minutes away. I've been there twice in the past week. My Mecca. I'm a happy woman. 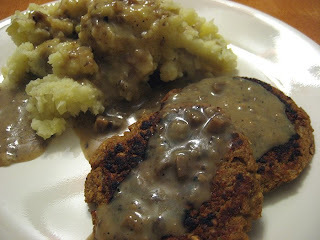 :) But back to the gravy... it was awesome but it's not vegan as it contains heavy cream. Not pictured is the yummy salad we had with the meal. That sounds like a really tasty meal! Vegan "Corn Chowder in Winter"